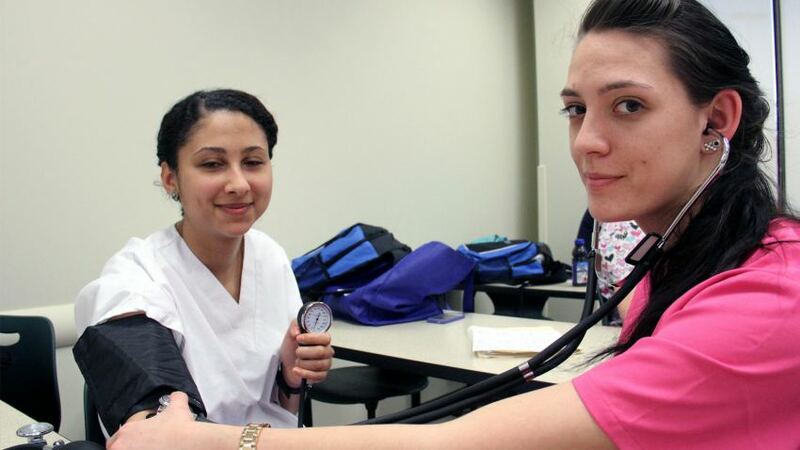 Health services is one of the fastest growing industries, and medical assisting is the sixth fastest growing job in the U.S. according to the Department of Labor. Working in a doctor’s office or clinic, clinical med-ical assistants help physicians carry out procedures, care for patients, perform simple lab tests, and administer medications. This course provides students with a comprehensive learning experience, designed to provide, through lecture and clinical instruction as well as online learning, a body systems approach to the role of the medical assistant. Lectures cover the anatomy, medical terminology and medical conditions pertaining to each body system. Clinical instruction provides hands-on training of the procedures associated with each body system. Competency is verified through a skills check-off system. Completion of the course prepares students to sit for the National Healthcareer Association (NHA) Certified Clinical Medical Assistant Certification Exam (CCMA). Prerequisites: There are no minimum state requirements for enrollment. We recommend that students are at least 18 years of age and have earned a high school diploma or its equivalent. Students Requirements: Attend mandatory orientation, required textbook, scrubs/closed toe shoes, & BLS for Healthcare Providers course. Additional expectations prior to employment in a doctor’s office or clinic is a criminal background check, tuberculosis screening, & a physical exam. Must attend a mandatory info session. Required textbook & workbook, NHA-CCMA exam study guide, and one NHA-CCMA exam voucher are included. Visit www.NHAnow.com to review CCMA certification.